The death of a man who wanted deeply to be loved. When I was 12, I was trudging along on 77th and Columbus with my sister and father, another desultory post-divorce dinner with dad. Like it was yesterday, I remember looking up and doing a double take, then a triple take, then a quadruple take: Robin Williams was walking alongside us. Robin. Effing. Williams. This would have been Robin Williams at the apex of his powers—at least in the eyes of a 12-year-old. After Mork and Mindy. After Popeye—which I was shocked to find out years later was “a bomb”—after Moscow on the Hudson, after his Night at the Met HBO special, a videotape of which we passed around school with the electric reverence of an illicit nudie magazine. Save Eddie Murphy, there was no one cooler. No one. Seeing him walking next to me was as remarkable and otherworldly for me as if my own 10-year-old was walking to school and bumped into Finn and Jake from Adventure Time. As I did speechless double and triple takes, Mr. Williams noticed me gawking at him, looked down and smiled. He was with a woman whose arm was entwined in his and she was bumping into him with her hip, smiling, as if to say, “Look at this goofy kid.” His smile turned into a wide grin beneath his beard as my eyes continued to expand. At the corner, they crossed the street and I finally was able to find my tongue, turn to my father and sister and stammer, “Wobin Rilliams! Bobin Billiams! Yo! That was Robin Williams! !” I think my father, whose comedic tastes tended toward the cartoons of The New Yorker, may have grunted. My older sister—although I frankly can’t remember her response—almost certainly rolled her eyes, as if I had just said I saw a Sasquatch. I remember grabbing them both and gesticulating at the couple across the street and saying, “I’m totally serious! That guy is Robin Williams!” After I was able to focus everyone’s disbelieving gaze, Robin Williams looked over at us, and danced. I’m completely serious. He did that Chuck Berry dance where you kick one leg up and down and hop up the street as if you are doing the guitar solo from Johnny B. Good. He looked over at us, and at at our walking pace, did that dance for about one quarter of a city block. Now it was my sister’s turn to have her jaw hit the ground. Then we cheered. I have, obviously, never forgotten that small moment of pre-adolescent magic. As I’ve been reading the obituaries and remembrances of Mr. Williams it has been striking just how seamlessly that tiny story fits with the words of people who actually knew him. You hear the same things; He was uncommonly kind. He absolutely adored children. He gave of himself without desire for public relations. Hell, he walked picket lines. And he truly—even manically—cared about being loved. Some of the most heartbroken remembrances, tellingly, have come from adults who acted with the man when they were still kids. It’s a rare quality: those who take the time to actually be kind to children. 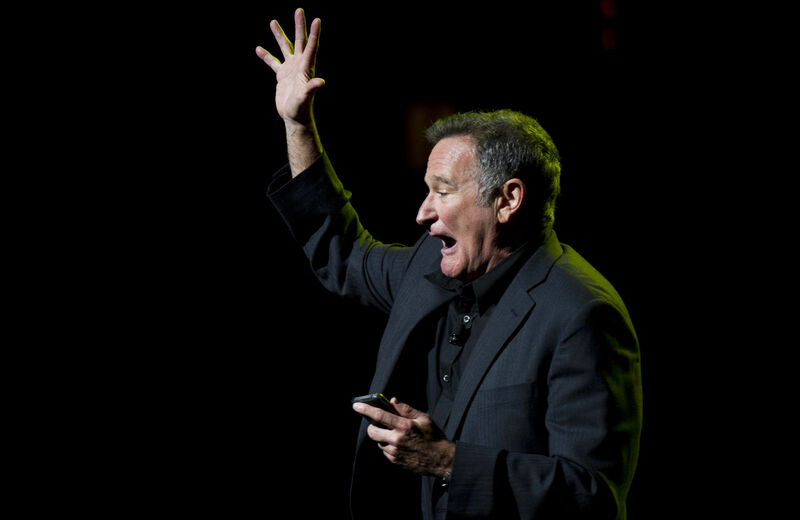 I don’t want to speculate about why Robin Williams took his life. People trying to tie it to the vicissitudes of his career—his show was cancelled!—frankly need to stop. Depression in this day and age is that powerful. If it finds you in the wrong place at the wrong time, it can swallow you whole. It’s happened to people I’ve loved. It’s happened to Robin Williams. I hope if nothing else that people in a similar circumstance reach for a phone instead of whatever instrument of death is handy. I also hope that Robin Williams’ family knows that their dad was truly loved. Not just for his art but for the small anonymous moments that revealed who he actually was when the applause stopped. I wish I’d been able to meet him as an adult and simply thank him for gracing my young self with a dollop of magic.